For other uses, see Azazel (disambiguation). Not to be confused with Azrael. Mount Azazel (Jabel Munttar) in the Judean Desert. Cliffs of Mount Azazel (Jabel Munttar). Azazel (/əˈzeɪzəl, ˈæzəˌzɛl/; Hebrew: עֲזָאזֵל; Arabic: عزازيل‎, translit. ʿAzāzīl) is a fallen angel; he was sent a scapegoat bearing the sins of the Jews during Yom Kippur. In the Bible, he only appears in association with the scapegoat rite. During the Second Temple period, he appears as a fallen angel responsible for introducing humans to forbidden knowledge. His role as a fallen angel partly remains in Christian– and Islamic traditions. In Islam, he is often, but not exclusively, associated with the Devil. "And Aaron shall cast lots"
In the Bible, the term is used thrice in Leviticus 16, where two male goats were to be sacrificed to Yahweh and one of the two was selected by lot, for Yahweh is seen as speaking through the lots. One goat is selected by lot and sent into the wilderness לַעֲזָאזֵל, "for Azazel". This goat was then cast out in the desert as part of Yom Kippur. 6 Aaron shall offer the bull as a sin offering for himself and shall make atonement for himself and for his house. 7 Then he shall take the two goats and set them before the Lord at the entrance of the tent of meeting. 8 And Aaron shall cast lots over the two goats, one lot for the Lord and the other lot for Azazel. 9 And Aaron shall present the goat on which the lot fell for the Lord and use it as a sin offering, 10 but the goat on which the lot fell for Azazel shall be presented alive before the Lord to make atonement over it, that it may be sent away into the wilderness to Azazel. Later rabbis, interpreting azazel as azaz (rugged) and el (of God), take it as referring to the rugged and rough mountain cliff from which the goat was cast down. 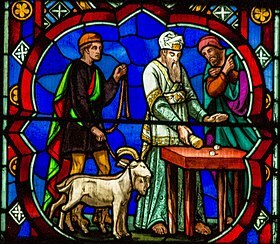 The translators of the Greek Septuagint understood the Hebrew term as meaning the sent away, and read: "8and Aaron shall cast lots upon the two goats, one lot for the Lord and the other lot for the scapegoat (Greek apopompaio dat.). 9And Aaron shall present the goat on which the lot fell for the Lord, and offer it as a sin offering; 10but the goat on which the lot of the sent away one fell shall be presented alive before the Lord to make atonement over it, that it may be sent away (Greek eis ten apopompen acc.) into the wilderness." Following the Septuagint, the Latin Vulgate, Martin Luther and the King James Version also give readings such as Young's Literal Translation: "And Aaron hath given lots over the two goats, one lot for Jehovah, and one lot for a goat of departure". According to the Peshitta, Azazel is rendered Za-za-e'il (the strong one against/of God), as in Qumran fragment 4Q180. In the Dead Sea Scrolls, the name Azazel occurs in the line 6 of 4Q203, The Book of Giants, which is a part of the Enochic literature found at Qumran. Despite the expectation of Brandt (1889)[further explanation needed] to date no evidence has surfaced of Azazel as a demon or god prior to the earliest Jewish sources among the Dead Sea Scrolls. According to the Book of Enoch, which brings Azazel into connection with the Biblical story of the fall of the angels, located on Mount Hermon, a gathering-place of demons of old, Azazel is one of the leaders of the rebellious Watchers in the time preceding the Flood; he taught men the art of warfare, of making swords, knives, shields, and coats of mail, and taught women the art of deception by ornamenting the body, dyeing the hair, and painting the face and the eyebrows, and also revealed to the people the secrets of witchcraft and corrupted their manners, leading them into wickedness and impurity until at last he was, at Yahweh's command, bound hand and foot by the archangel Raphael and chained to the rough and jagged rocks of [Ha] Dudael (= Beth Ḥadudo), where he is to abide in utter darkness until the great Day of Judgment, when he will be cast into the fire to be consumed forever. The whole earth has been corrupted through the works that were taught by Azazel: to him ascribe all sin. According to the Book of Enoch (a book of the Apocrypha), Azazel (here spelled ‘ăzā’zyēl) was one of the chief Grigori, a group of fallen angels who married women. This same story (without any mention of Azazel) is told in the book of Genesis 6:2–4: "That the sons of God saw the daughters of men that they were fair; and they took them wives of all which they chose. […] There were giants in the earth in those days; and also afterward, when the sons of God came in unto the daughters of men, and they bore children to them, the same became mighty men which were of old, men of renown." Enoch portrays Azazel as responsible for teaching people to make weapons and cosmetics, for which he was cast out of heaven. The Book of Enoch 8:1–3a reads, "And Azazel taught men to make swords and knives and shields and breastplates; and made known to them the metals [of the earth] and the art of working them; and bracelets and ornaments; and the use of antimony and the beautifying of the eyelids; and all kinds of costly stones and all colouring tinctures. And there arose much godlessness, and they committed fornication, and they were led astray and became corrupt in all their ways." The corruption brought on by Azazel and the Grigori degrades the human race, and the four archangels (Michael, Gabriel, Raphael, and Uriel) “saw much blood being shed upon the earth and all lawlessness being wrought upon the earth […] The souls of men [made] their suit, saying, "Bring our cause before the Most High; […] Thou seest what Azazel hath done, who hath taught all unrighteousness on earth and revealed the eternal secrets which were in heaven, which men were striving to learn." God sees the sin brought about by Azazel and has Raphael “bind Azazel hand and foot and cast him into the darkness: and make an opening in the desert – which is in Dudael – and cast him therein. And place upon him rough and jagged rocks, and cover him with darkness, and let him abide there forever, and cover his face that he may not see light.” Azazel's fate is foretold near the end of Enoch 2:8, where God says, “On the day of the great judgement he shall be cast into the fire. Several scholars have previously discerned that some details of Azazel's punishment are reminiscent of the scapegoat rite. Thus, Lester Grabbe points to a number of parallels between the Azazel narrative in Enoch and the wording of Leviticus 16, including "the similarity of the names Asael and Azazel; the punishment in the desert; the placing of sin on Asael/Azazel; the resultant healing of the land." Daniel Stökl also observes that "the punishment of the demon resembles the treatment of the goat in aspects of geography, action, time and purpose." Thus, the place of Asael’s punishment designated in Enoch as Dudael is reminiscent of the rabbinic terminology used for the designation of the ravine of the scapegoat in later rabbinic interpretations of the Yom Kippur ritual. Stökl remarks that "the name of place of judgment (Dudael) is conspicuously similar in both traditions and can likely be traced to a common origin." Azazel in 1 Enoch has striking similarities to the Greek Titan Prometheus. He might be a demonized counterpart of a heavenly creature, who provided knowledge for people to make weapons, thus causing bloodshed and injustice. The latter might be identified with Greek kings and generals, who suppressed the Jews with military forces, but learned how to make their weapons by this specific expelled creature. In the fifth-century 3 Enoch, Azazel is one of the three angels (Azza [Shemhazai] and Uzza [Ouza] are the other two) who opposed Enoch's high rank when he became the angel Metatron. Whilst they were fallen at this time they were still in Heaven, but Metatron held a dislike for them, and had them cast out. In the extra-canonical text the Apocalypse of Abraham (c.1st CE), Azazel is portrayed as an unclean bird who came down upon the sacrifice which Abraham prepared. (This is in reference to Genesis 15:11: "Birds of prey came down on the carcasses, but Abram drove them away" [NIV]). And it came to pass when I saw the bird speaking I said this to the angel: "What is this, my lord?" And he said, "This is disgrace – this is Azazel!" And he said to him, "Shame on you, Azazel! For Abraham's portion is in heaven, and yours is on earth, for you have selected here, [and] become enamored of the dwelling place of your blemish. Therefore the Eternal Ruler, the Mighty One, has given you a dwelling on earth. Through you the all-evil spirit [was] a liar, and through you [come] wrath and trials on the generations of men who live impiously. The text also associates Azazel with the serpent and hell. In Chapter 23, verse 7, it is described as having seven heads, 14 faces, "hands and feet like a man's [and] on his back six wings on the right and six on the left." Abraham says that the wicked will "putrefy in the belly of the crafty worm Azazel, and be burned by the fire of Azazel's tongue" (Abr. 31:5), and earlier says to Azazel himself, "May you be the firebrand of the furnace of the earth! Go, Azazel, into the untrodden parts of the earth. For your heritage is over those who are with you" (Abr. 14:5–6). The Mishnah (Yoma 39a) follows the Hebrew Bible text; two goats were procured, similar in respect of appearance, height, cost, and time of selection. Having one of these on his right and the other on his left, the high priest, who was assisted in this rite by two subordinates, put both his hands into a wooden case, and took out two labels, one inscribed "for Yahweh" and the other "for Azazel". The high priest then laid his hands with the labels upon the two goats and said, "A sin-offering to Yahweh" (thus speaking the Tetragrammaton); and the two men accompanying him replied, "Blessed be the name of His glorious kingdom for ever and ever." He then fastened a scarlet woolen thread to the head of the goat "for Azazel"; and laying his hands upon it again, recited the following confession of sin and prayer for forgiveness: "O Lord, I have acted iniquitously, trespassed, sinned before Thee: I, my household, and the sons of Aaron Thy holy ones. O Lord, forgive the iniquities, transgressions, and sins that I, my household, and Aaron's children, Thy holy people, committed before Thee, as is written in the law of Moses, Thy servant, 'for on this day He will forgive you, to cleanse you from all your sins before the Lord; ye shall be clean.'" This prayer was responded to by the congregation present. A man was selected, preferably a priest, to take the goat to the precipice in the wilderness; and he was accompanied part of the way by the most eminent men of Jerusalem. Ten booths had been constructed at intervals along the road leading from Jerusalem to the steep mountain. At each one of these the man leading the goat was formally offered food and drink, which he, however, refused. When he reached the tenth booth those who accompanied him proceeded no further, but watched the ceremony from a distance. When he came to the precipice he divided the scarlet thread into two parts, one of which he tied to the rock and the other to the goat's horns, and then pushed the goat down (Yoma vi. 1–8). The cliff was so high and rugged that before the goat had traversed half the distance to the plain below, its limbs were utterly shattered. Men were stationed at intervals along the way, and as soon as the goat was thrown down the precipice, they signaled to one another by means of kerchiefs or flags, until the information reached the high priest, whereat he proceeded with the other parts of the ritual. The scarlet thread is symbolically referenced in Isaiah 1.18; and the Talmud states (ib. 39a) that during the forty years that Simeon the Just was High Priest of Israel, the thread actually turned white as soon as the goat was thrown over the precipice: a sign that the sins of the people were forgiven. In later times the change to white was not invariable: a proof of the people's moral and spiritual deterioration, that was gradually on the increase, until forty years before the destruction of the Second Temple, when the change of color was no longer observed (l.c. 39b). The medieval scholar Nahmanides (1194–1270) identified the Hebrew text as also referring to a demon, and identified this "Azazel" with Samael. 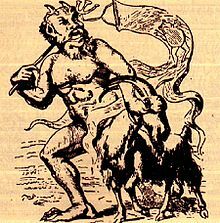 However, he did not see the sending of the goat as honouring Azazel as a deity, but as a symbolic expression of the idea that the people's sins and their evil consequences were to be sent back to the spirit of desolation and ruin, the source of all impurity. The very fact that the two goats were presented before God, before the one was sacrificed and the other sent into the wilderness, was proof that Azazel was not ranked alongside God, but regarded simply as the personification of wickedness in contrast with the righteous government of God. The rite, resembling, on one hand, the sending off of the basket with the woman embodying wickedness to the land of Shinar in the vision of Zechariah (5:6-11), and, on the other, the letting loose of the living bird into the open field in the case of the leper healed from the plague (Lev 14:7), was, indeed, viewed by the people of Jerusalem as a means of ridding themselves of the sins of the year. So would the crowd, called Babylonians or Alexandrians, pull the goat's hair to make it hasten forth, carrying the burden of sins away with it (Yoma vi. 4, 66b; "Epistle of Barnabas," vii. ), and the arrival of the shattered animal at the bottom of the valley of the rock of Bet Ḥadudo, twelve miles away from the city, was signalized by the waving of shawls to the people of Jerusalem, who celebrated the event with boisterous hilarity and amid dancing on the hills (Yoma vi. 6, 8; Ta'an. iv. 8). Evidently the figure of Azazel was an object of general fear and awe rather than, as has been conjectured, a foreign product or the invention of a late lawgiver. More as a demon of the desert, it seems to have been closely interwoven with the mountainous region of Jerusalem. English versions, such as the King James version, followed the Septuagint and Vulgate in understanding the term as relating to a goat. The modern English Standard Version provides the footnote "16:8 The meaning of Azazel is uncertain; possibly the name of a place or a demon, traditionally a scapegoat; also verses 10, 26". Most scholars accept the indication of some kind of demon or deity, however Judit M. Blair notes that this is an argument without supporting contemporary text evidence. According to The Expositor's Bible Commentary, Azazel is the Hebrew word for scapegoat. This is the only place that the Hebrew word is found in the whole Hebrew Old Testament. It says that the Book of Enoch, (extra-biblical Jewish theological literature, dated around 200 B.C.) is full of demonology and reference to fallen angels. The EBC (Vol 2) says that this text uses late Aramaic forms for these names which indicates that The Book of Enoch most likely relies upon the Hebrew Leviticus text rather than the Leviticus text being reliant upon the Book of Enoch. Cyril of Alexandria sees the apompaios (sent-away one, scapegoat) as a foretype of Christ. Origen ("Contra Celsum," vi. 43) identifies Azazel with Satan. Illustration from an Arabic manuscript of the Annals of al-Tabari showing Iblis (Azazel), depicted in black, refusing to prostrate before the newly-created Adam. Painting Fālnāmeh (Book of Omens) ascribed to Ja´far al-Sādiq. Iblis (or Azazel) (bottom-left), the serpent and the peacock depicted here. In Islamic tradition, Azazel (Arabic: عزازيل Azāzīl, also known as Arabic: حارث Ḥārith ) is depicted as a former archangel, who is identified with Iblis, that means "to despair". Accordingly Azazel despaired from God, thus earning him the name Iblis. The name Azazel may also related to the Arabic words Aziz and il with the meaning either God's strength or God's dear, the latter referring to Azazil, as God's once favorite angel. Although Azazel is not mentioned by name in Quran, he is commonly mentioned in some reports of the Sahabah especially those attributed to Ibn Abbas. Sometimes Azazel is recognized as an angel different from Iblis, who accompanied Harut and Marut to earth. In this case, Azazel appears in direct reference to the Watchers. Traditionally Azazel is depicted as an angel with four wings, who was the leader and teacher of the other angels. Additionally he was appointed as the ruler of the lower heavens and the earths and was member of an angelic group called 'jinn', who were the guardians of Jannah. Then the former inhabitants of earth caused corruption, Azazel came down from the heavens with an army of angels to defeat them. Then God created human to supersede the former inhabitants of earth, Azazil grow haughty, since he thought, the angels were now the favorite creation of God, thereupon He ordered the angels to prostrate before human as a test. Azazel along with the angels argued, why God should create a human being, who will shed blood and confusion like the former inhabitants, whom they had just defeated before, while the angels prostrate before God and sing his glory day and night, thus would never fail Gods orders. Since Azazel insisted on being superior than any other creature, even compared to other angels, he refused to prostrate himself, whereupon he was cast out of heaven. He lost his rank as a member of the keepers of paradise. He was cast down to earth, expelled from the presence of God. He was turned from an angel into a demon. His name was changed into iblis. He became the head of the damned. He was cursed by God. His insight was taken away. He was made unruly, someone who misses the mercy of God. He became the preacher of the hellfire. Further Al-Tha`labi relates a story, in which Azazel tried to sneak back into the Garden Eden and tricked its keeper by hiding inside the mouth of a serpent and with the aid of a peacock. In Malays lore, Azazel appears both as an angel and Al-Jann. Accordingly, Azazel used to be an angel, but was turned into Jann after his refusal to bow down before Adam and then begot the Jinn. They once dwelled in the lowest heaven, but descended to earth, then they battled each other and become disobedient towards God. In the Ismaili work Umm al-Kitab, Azazel is the first emanation of the high king (God) and loaned the power of creation from Him. Because he was also able to create, he boasted himself being another god besides his Creator. God answered him: "It is impossible, that there will be two gods." Afterwards God made a creation which exceeds these of Azazel, so Azazel may confess, he wholly depends on God. But Azazel refuses to accept the new creation 'Salman', therefore he sinned again. Everytime, Azazel sinned, God took away a colour until he and those who sided with him, became darker and more inferior. Finally they reach the earthen plane, that is accordingly made out of the essence of Azazels creation. In contrast, the lifeforce of human originated from the heavenly realm. Azazel whereupon seduces humans, leading them into the material realm, trying to keep them trapped there. The depiction of Azazel in Umm al-Kitab, resembles the Gnostic Demiurge. According to Alevi oral tradition regarding the creation of the world, the archangel Cebrail (Gabriel) taught the other archangels Mikail, Israfil, Azrail and Azazel, they are all creatures made by God. All of these angels believed him, except Azazel. Thus Cebrail introduced Azazel to follow, showing him the truth about their origin. Thereupon Cebrail led Azazel to a lamp, which had seven doors, but these doors won't open. A voice sounded, they shall serve here for 1001 days. They all did, after that the doors opened and the angels entered the lamp. Inside the lamp there were two lights forming one body. A voice sounded again, commanding the angels to prostrate themselves before the light. Azazel responded: "This is also a created body", and refused to prostrate himself before the lights, but remained in service of God. In Alevi perspective, this narration shows that Azazel served God, until the "last door" opened, but then he despised it and moved into the "Ego-world". This causing the later enmity between Satan and humanity. According to Sufism, Azazel commonly served God over thousands of years before the creation of the world. God forbid him to worship something else than his Creator. Therefore Azazel declined, then God ordered the angels to prostrate themselves before Adam. He did not know, that worshiping by the command of God is equivalent to worshipping God. Thus, in reference to Surah 15:35, God's curse lies upon Azazel until the Day of Judgment and he became the representative for God's attributes in respect to misleading, darkness and majesty. After the world perishes, Azazel's curse is broken and he will return to his place in heaven. However, Sufi writers such as the tenth-century mystic Mansur Al-Hallaj, declined that Azazel will be restored to God's grace and that he is indeed damned after the Day of Judgment. Mansur Al-Hallaj mentioned Azazel in his collection Tawasin. Chapter Six of that writing is dedicated to the self-defence of Azazel, and in one section Hallaj explains how each of the letters of Azazel's name relate to his personality. Due to obedience the heaven became filled with light and due to obedience the angels became flawless and holy. Impudence darkened the sun and because of his impudence Azazil was shown the door. In the second mentioning, Azazil is used synonymously with Eblis (Iblis) and yet in another instance, ecstasy of excessive self-awareness turned him from Azazil to Elbis. In Yazidism, Azazel appears as one of the Archangels, along with Jabra'il, Mika'il, Rafa'il (Israfil), Dadra'il, Azrael and Shamkil (Shemna'il). According to a Yazidi legend, Azazel was once banished to hell, but then repented his sin, crying until the fires of hell were extinguished, eventually returned to God's grace. In the Yazidi Black Book, is erroneously identified with Melek Taus by Western translators, who confused Azrael (or Jabrail) with Azazel. Singer, Isidore; et al., eds. (1901–1906). "Azazel (Scapegoat, Lev. xvi., A. V.)". The Jewish Encyclopedia. New York: Funk & Wagnalls. ^ "Azazel". Jewish Encyclopedia. Jewish Encyclopedia. JewishEncyclopedia.com. 1906. ^ For a delineation of the various Rabbinic opinions here, see R. Aryeh Kaplan's note on "Azazel" (Lev 16:8). ^ 3 Mose 16:8 German: Luther (1545) Und soll das Los werfen über die zween Böcke, ein Los dem HERRN und das andere dem ledigen Bock. ^ Ralph D. Levy The symbolism of the Azazel goat 1998 "the midrash is less elaborate than in 1 Enoch, and, notably, makes no mention of Azazel or Asa' el at all." ^ a b c Andrei Orlov (2009), "Azazel as the Celestial Scapegoat". An excerpt (pp. 79-111) from his contribution "The Eschatological Yom Kippur in the Apocalypse of Abraham: Part I: The Scapegoat Ritual" to A. Orlov and B. Lourié, eds., Symbola Caelestis. Le symbolisme liturgique et paraliturgique dans le monde Chrétien. ^ Israel Drazin, Stanley M. Wagner, Onkelos on the Torah: Understanding the Bible Text Vol.3, p. PA122, at Google Books. Gefen, 2008. p. 122. ISBN 978-965-229-425-8. ^ Wright, David P. "Azazel." Pages 1:536–37 in Anchor Bible Series. Edited by David Noel Freedman et al. New York: Doubleday, 1992. ^ Gabelein, Frank E. (1990). The Expositor's Bible Commentary. Grand Rapids: Zondervan. p. 590. ISBN 978-0310364405. ^ Stephen J. Vicchio & Biblical Figures in the Islamic Faith, p. 184 ps.= Jinn here, designates a group of angels, the origin of their name came from "Jannah", because they were its keeper. Should not be confused with the "Jinn" as a spiritual entity on earth. ^ Patrick Hughes & Dictionary of Islam Asian Educational Services, p. 135 ps.= some Muslims hold, shares the same verbal root than the earthen Jinn (hidden) but here, due to his special position, he was veiled from the eyes of the other regular angels. ^ name="Scott B. Noegel page 295"
^ Pīr Ṣadr ad-Dīn. "100 ginānjī ćopaḍī ćogaḍīevārī". Bombay: Lāljībhāī Devrāj, Khojā Siñdhā Ćhāpākhānû, 1903. MS Indic 2534. Houghton Library, Harvard University, Cambridge, Mass.